This is a small footprint pedal, 61mm x 76mm x 127mm, and weighs 0.5Kg. It is a solid pedal made of metal. It has quite a small range of motion (18mm) compared to a full size pedal, but it is very smooth and feels good. 18mm does not seem much, but there is plenty of room for expression. What is interesting about this pedal is its versatility, the way that versatility has been achieved and also the way it has been labelled. It has all three polarities, TRS, RTS and TS, via a selection switch, and 25Kohm and 10Kohm outputs also selectable by a switch. (25K for TRS and RTS; 10K for TS). This makes it universal and will work with most if not all, effects units, MIDI controllers and keyboards. 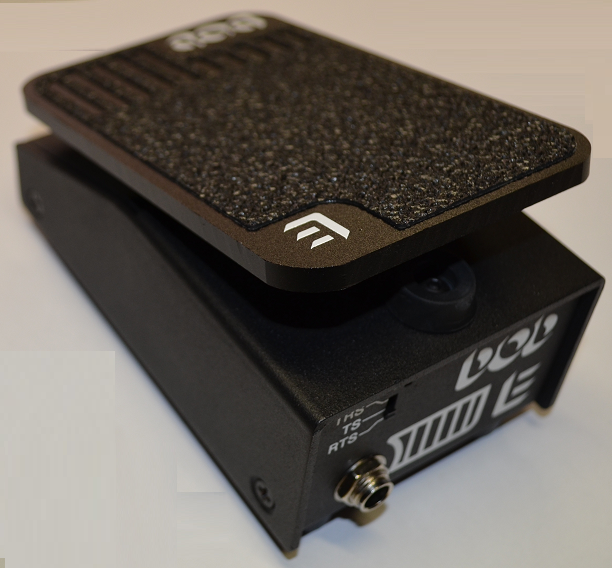 Most effects units, MIDI controllers and keyboards expect a TRS expression pedal, but a few require RTS and Line 6 notably require a TS expression pedal. The resistance values also make it versatile as most TRS effects units, MIDI controllers and keyboard will work with a 25Kohm, but notably Line 6 devices ask for a 10K ohm expression pedal. 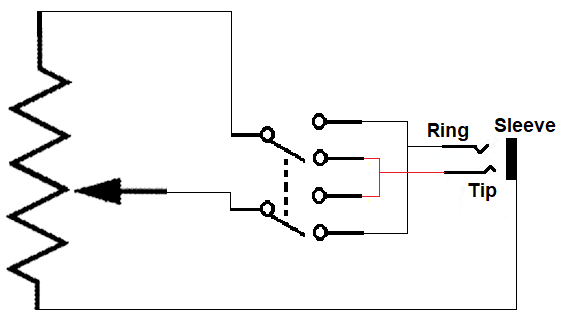 Switching between TRS and RTS is a matter of swapping the connections between the tip and the ring. 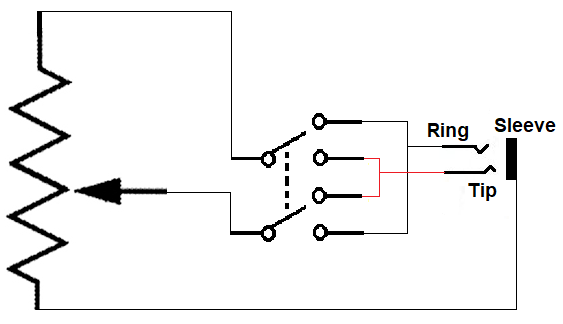 In the picture here the current position of the switch has the tip connected to the wiper, and the ring connected to one end of the potentiometer. This is what is usually called TRS. TRS/RTS switches are common enough. In facts there are at least thirty brands and models of expression pedals that have TRS/RTS switches. What is most interesting for this expression pedal is the way in which TS has been implemented. In this picture the switch has been moved and the tip is now connected to one end of the potentiometer and the ring is connected to the wiper. This is what is usually called RTS. For most of the potentiometers travel things work out pretty well and the resistance changes in mostly a linear fashion. However, there are some caveats with putting resistances in parallel. One issue with the resistance in parallel is overcome by the physical design of the enclosure. Over the last perhaps 20% of the potentiometers physical travel the resistance does not change much, perhaps only 11Kohm to 11.11Kohm. Normally this would be a dead spot where there is very little if any change in effect modulation. However, the enclosure has been designed such that the last 20% of potentiometer travel is prevented by a rubber stopper that prevents the treadle from going any further than parallel with the base, and so the problem is circumvented by reducing the treadle travel slightly so that the dead spot is never reached. 11Kohm rather than 10Kohm is not an issue as even the Line 6 EX-1 expression pedal has an 11Kohm potentiometer in it (Line 6 recommend a 10Kohm expression pedal). The second issue can be a problem unless your effects unit has a calibration function. 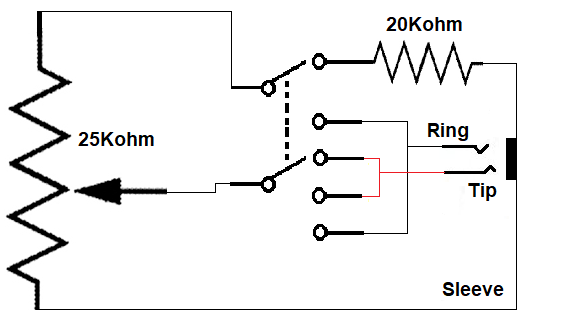 When in TRS or RTS mode, the same rubber stopper that prevents the dead spot when set to TS 10Kohm, also prevents the 25Kohm potentiometer from completing its full travel. And so the maximum resistance is actually 20Kohm, not 25Kohm. This means that there is a limited voltage swing back at the effect unit or MIDI controller. So, rather than 0 – 3.3 volts, the limited physical range means it is more like 0 – 2.75 volts. The limited potentiometer range means that an effect parameter is not fully modulated, and/or the full range of MIDI controller data is not obtained. Rather than 0 - 127, the MIDI data would be more like 0 – 109. The limited range may or may not be a problem depending on what a user wants and depending on whether your effect unit has a calibration function. Assuming you can calibrate your effects unit, then the issue is removed. If you cannot calibrate then there could be a problem. For example, not being able to obtain the full Wah-Wah effect may not be an issue as there is still a significant sweep so that you get a good Wah-Wah sound, though the brightness usually found at the far end of a pedals travel will be missing. If modulating the pitch parameter, it means that the higher pitches are never reached, and for an effect like Whammy where things are set to modulate over a full one or two octaves, it means the upper tone or two will not be reached and things will sound discordant. For MIDI data the issue is the same, if the configuration is set to modulate the pitch wheel for example, the full range will not be reached and part of a tone or an octave will be missing, making things sound discordant. Removing the rubber stopper allows nearly the full range of potentiometer resistance. For effects it is probably good enough, but for MIDI data it actually stops at 126 unless you give it a good push. Removing the cover completely, allows the full range of motion and hence full effect modulation and full MIDI data are possible. DOD/Digitech/Harman have a history of messing up, or perhaps a different opinion of, RTS and TRS. In their RP360 effects unit the manual says that a TRS expression pedal is required. However, testing shows that is not the case. In fact a RTS expression pedal is required. The DOD mini expression pedal replicates this error. When TRS is selected with the switch, the wiper goes to the ring not to the tip. This is not the way that most if not all TRS expression pedals are wired. Usually for TRS pedals the tip goes to the wiper. But for the DOD when RTS is selected the unit is actually set for industry standard TRS and vice versa. The upside of this is that when using the DOD mini expression pedal with a Digitech RP360 effects unit, selecting TRS on the expression pedal will see things working correctly. If using the DOD mini expression pedal with TRS effects units, MIDI controllers and keyboards, selecting RTS will see things working correctly. Perhaps it is a labelling issue, a marketing strategy, or just a difference of opinion regarding the terms RTS and TRS. Interestingly it is not a perfect fit for Digitech’s own early RP series of effect units which required a 250Kohm TS pedal (volume pedal). The DOD mini with 10Kohm will not create much modulation with the early RP series. The labelling is not an issue if you know what’s going on, but the limited TRS and RTS range can be an issue if your effects unit cannot be calibrated. It is an interesting pedal with a clever design. It feels solid and smooth.